For vegetarians who aren't lactose intolerant, dairy products can provide some good protein. 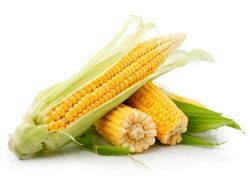 And, because these products often come in low-fat and non-fat versions, they don't have to add catastrophically to your fat load. Perhaps you're one of the hold-outs yourself? If so, perhaps you might consider a gradual conversion. For example, nonfat and low-fat milk can taste quite good with both dry and cooked cereals; maybe give those a try every other cereal morning. And if you like the occasional cup of hot chocolate, you may find that you hardly notice the difference between whole and low/nonfat milk. Plus, the lower-fat versions will likely be way better for your arteries. Either way, you're looking at 8 grams of protein per cup, which ain't too shabby. If you can, bring home organic milk products. A surprisingly versatile food, the Greek version is also quite rich in protein: 15 to 20 grams per 6-ounce serving (which seems a rather large serving, IMHO, but oh well). Regular yogurt weighs in at 9 to 10 grams for the same amount. Tasty in smoothies, a good substitute for sour cream in certain recipes, even a meal when fruit or veggies are added, yogurt can fit into a lacto-ovo vegetarian kitchen quite nicely. At 14 grams per half cup, cottage cheese is a serious hitter with numerous applications. For example, toss some dry-curd or rinsed and drained cottage cheese into a green salad, and watch the protein content shoot up. Or that of waffles or pancakes when you add cottage cheese (or yogurt). And try some (drained first) in that lasagna you're making—or in other pasta dishes where it seems plausible. But, again, do consider low-fat/non-fat organic versions to spare your arteries and avoid added hormones. So many cheeses, so little time, right? If you're a "cheese head," you've probably sampled a broad variety: cheddar, gruyere, edam and gouda, gorgonzola, mozzarella, havarti, jack, parmesan and romano, bri and ricotta...to name but a few. 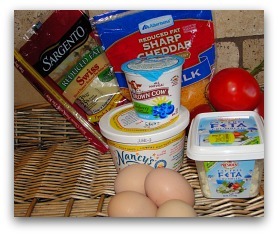 All of these can be good sources of protein...and a good many of them also "good" sources of sodium and saturated fat. Sure, by all means eat cheese if you don't have a health (or philosophical) issue that makes it unwise to do so. Just remember that, although it may taste like the world's perfect food, it carries some baggage. If that baggage is a concern, this might be a good cookbook for you to consider. I've actually tried some of the recipes myself, and they taste surprisingly good (even to a cheese-lover). And let's don’t forget eggs: 6 to 7 grams of protein each, depending upon their size. As many would agree, a nice omelet or a few deviled eggs can taste great now and then. Yes, there's some disagreement about how many we should eat and how often, but nutritional gurus increasingly suggest that we eat an egg or two now and then. If you have health factors to consider, however, it would be good to do further research and perhaps consult with a nutritional expert. Also, those of us who do choose to eat eggs need to remain aware of our oil, butter, and salt usage, as a heavy hand with these can quickly turn Dr. Jekyll into Mr. Hyde. In the unlikely event that you're strangers, please say hello some other good sources of protein that, although vegetarian—sometimes even vegan—you need be neither to enjoy: soy products and seitan. 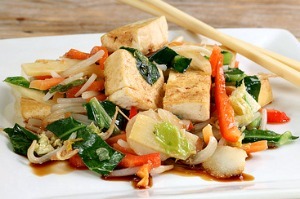 Both unfermented (tofu) and fermented (tempeh), soy products can be quite good sources of protein. Tofu, for example, provides roughly 10 grams of protein per half cup—not as much as seitan, but still not bad. If you don’t eat tofu yourself, is it because you can’t deal with the texture? (Raising my hand here…) Click on this link for a couple of tips that might change your attitude and on this one for broader discussion of soy products. Made from wheat gluten, seitan packs quite a protein punch: roughly 20 grams per 3-ounce serving, stacking up pretty well against beef. Even better, it contains 70 fewer calories and minimal fat (unlike steak at 12 grams, most of it saturated). And—yay!—you can even make it at home from gluten flour. In a nutshell, seitan can be a significant source of protein, although obviously unsuited to the gluten-intolerant diner. Use it as you would chicken. Who knew there were so many good sources of protein among the plant-based foods? Now that you do, perhaps cutting back on meat will begin to seem more practical...even perhaps worth a serious try. Ready to go for it?